All I own | Save. Spend. Splurge. I have a fascination with looking at what people own, and what they carry around everyday in their bags or purses. 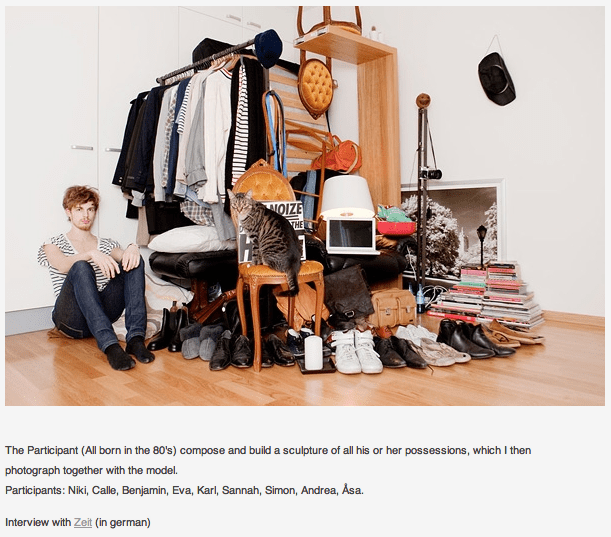 So it’s no secret that this particular photography project by Sannah Kvist entitled All I Own, caught my interest immediately. It’s even more interesting because it’s more relevant to me — it features young people and what they own, whereas other projects seemed to focus on families with kids who show what they own in their house. I went through all 9 photos, and this particular one is probably the closest to what I own, aside from the cat, all the furniture, and books. 🙂 In their stead, I have electronics. What I own personally is mostly stuff in my wardrobe, basic office supplies, toiletries & makeup, and a LOT of electronics. Otherwise, household things are cutlery, pots, pans, and knives. We don’t own any furniture (every hotel has the basics), and everything we BOTH own jointly and personally, fits into one car in suitcases. The All I Own photography project can and should be perused. It is my inspiration for the upcoming week as I go through my things again. Wow that’s a lot of shoes for a dude. I have 3 pairs: black shoes for work, trail running shoes, and sandals. 4 if you count snowshoes I guess. Also, where’s the cat’s litter box in this picture? I think he’s probably more into fashion than most guys. BF has 1 pair of shoes. Exactly 1 pair he uses for everything.